Therefore this product is suitable for actual farm condition, compared to other anaerobically cultured product or self culture media. • AquaBacta Liqid contains high protein content and quality essential amino acid so it increases BWG(Body Weight Gain) of hatchery fishes. • Therefore this product is suitable for actual farm condition, compared to other anaerobically cultured product or self culture media. • AquaBacta Liqid contains a large quantity of pigments like chlorophyll, carotene, ubiquinone, meniquinone, astazanthin, etc. and physiologically active compounds, making fishes healthy and color and the quality of meat equivalent to natural product. • AquBacta Liqid contains plenty of essential amino acids, vitamin B12, folic acid, biotin, etc. 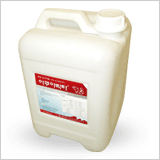 specially required for growth of hatchery fish, promoting growth and helping prevention of fish diseases by keeping active metabolism of fishes. • AquaBacta Liqid proliferates to be dominant species in the water, inhibits other pathogenic bacterial including virus from proliferation, and reduces use of antibiotics, resulting in obtainment of safer and healthier hatchery fish. • With capacities of removing organic matters and fixing ammonia, AquaBacta is also frequently used in a night soil treatment plant. Keep this product in a fresh place without direct rays. Shake this product prior to use. Do not mix this product with chemicals such as disinfectant, sterilizer, etc. at use. The shelf life is 3 months from the manufactured date. Use except for the designated purposes is prohibited.